In the heart of Ginza an exhibition transports visitors to a choral heaven. As you walk into the current show at Hermes, you may be confused. There is no hint of the visual here, nothing in particular to look at; instead, you are overwhelmed by sound. 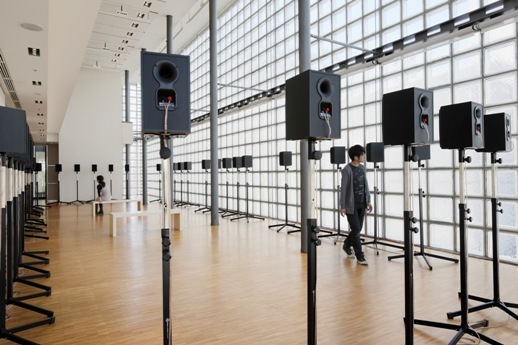 Forty speakers are arrayed within the stripped-down space, each playing the recorded voice of one person singing his or her part in a sixteenth-century religious score; the effect is of an invisible choir. All you see is speakers, but what you hear is the richness of many human voices. This effect is the work of Janet Cardiff and George Bures Miller, a pair of Canadian artists who live and work together. (Miller had minimal involvement with this particular sound installation, but did work closely with Cardiff on the other piece in the show.) Their work ranges from the personal (2004’s ‘Road Trip’ displays slide images taken by Miller’s grandfather during a cross-country trip shortly before his death) to the public (Cardiff’s recorded ‘Walks’ lead participants on audio and video tours of cities including New York, Montreal and Berlin). All of their installations incorporate some elements of sound and video recording, but always they use this high-tech equipment to create a low-tech experience of immersion: the same breakdown of disbelief that makes a novel or a play work. And always the artists eventually jolt the viewer out of that immersion experience with some reminder that this is art, not the real world. In ‘The Forty-Part Motet’ at Hermès, the wake-up call takes the form of an intermission. One moment you’re listening to this incredible music surging all around you, perhaps releasing yourself into a state of bliss; then, suddenly, the singing stops. But the recording doesn’t – you slowly become aware that the speakers are continuing to emit the sounds of choristers on break: yawns, low conversations, a bit of humming and coughing. After three minutes, the music starts again. The recording is the Salisbury Cathedral Choir singing ‘Spem in Alium Nunquam Habui,’ a motet written by the British court composer Thomas Tallis in the 1570s. While the subject of the text is fairly standard (a hymn of praise based on the Book of Judith), its form is innovative: it was written for eight choirs of five people each (soprano, alto, tenor, baritone, and bass) and it was intended to be sung in the round. At the aristocratic residence where it was first performed, musicologists believe, the eight choirs split into balconies surrounding a large room and sang facing the audience in the center. The score was written to maximize the dramatic effect of the space, as the sound begins by “rotating” from one choir to the next until they eventually join together. What Cardiff has done here is to reproduce that early experience of the piece for us latter-day non-aristocrats: we can sit in the center and feel totally surrounded by the music, or stroll around the room and try to identify with the various singers. A version of this work is on permanent view in a reconstructed school chapel at the National Gallery of Canada in Ottawa, but it has been installed in all kinds of places: religious, cultural, large and small. This is probably one of the tinier spaces for this installation, but it works. The extreme regularity of Piano’s architecture matches well with the identical speakers to contrast with the individuality of the singer’s voices. The gallery’s pale palette, accentuated by the watery Tokyo light that comes through the glass block of the walls, just seems to give way before the full feeling of the music. Even this box of a room is made to feel like a cathedral. 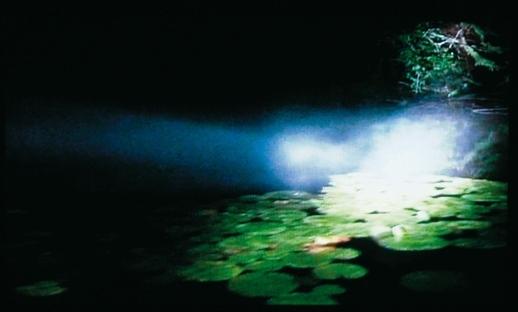 A similar feeling of immersion – this time in silence – is also created by the show’s other work, ‘Night Canoeing.’ Cardiff and Miller collaborated on this 17-minute video and audio loop, which plays in a black box. The creaking of the boat, the splashing of the oars, and the mist rising off water and lily pads all create a tremendously peaceful feeling that lasts until you step back out into the street.